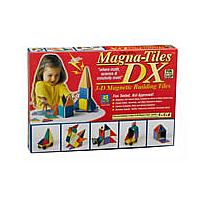 MagnaTiles DX 48 Piece Set 2148 - Valtech Co. Solid colored pieces, but with additional total number and also with unique pieces that have holes, are curved, a magnetic door and a wheeled piece. This product provides more pieces for a classroom, and are a great addition with the special pieces. Idea guide included.